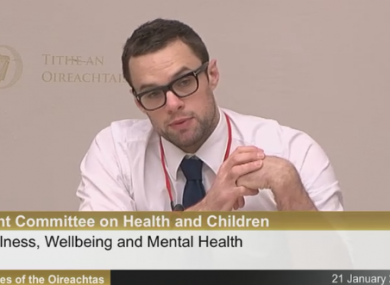 BRESSIE HAS GIVEN an impassioned speech about mental health and wellbeing at a meeting of the Oireachtas health committee. The musician and activist spoke about how his passion to help people dealing with mental health issues dates back to his own struggles with anxiety. “[As] a teenager I simply did not have the capacity to cope with an utterly dominant anxiety disorder that seemed hell-bent on robbing me of my character and personality at every available opportunity. “Crippling insomnia, harrowing panic attacks and incomprehensible self-harm dictated my life, all disguised behind a mask of normality that polarised the general lazy stereotype or label we associate with those with a mental health illness. Some days I would sit in my classroom on the verge of fainting as I hyperventilated and fought for air while my teachers continued to teach the class, oblivious to the fact that one of their students was in the midst of a living nightmare. I spent so many of my school days praying that some of our teachers may talk about this, or just say something so I didn’t feel so isolated and terrified. They never did. He said the government needs to act to help young people dealing with mental health issues. “The reality is our youth, the future of this country, need help. They are exposed to too much, so much is expected from them, and both the external and internal pressures they are being asked to cope with are simply not sustainable, and the result is the great epidemic of this generation. Bressie (Niall Breslin), said the country is currently in a period of transition, noting the “stigma that has ravaged families throughout Ireland for generations is slowly eroding”. He said schools, students and organisations across the country are doing “powerful work” in this area. Through his website, A Lust for Life, many people have contacted Bressie about their own experiences of mental health. He said many families feel “totally abandoned” while others “have to drive hundreds of miles and wait months to see a health care professional”. Bressie proposed a number of measures, including that mental health and wellbeing are implemented into the education curriculum, and an increase in funding and support to organisations helping people with mental health issues. He spoke about a family friend who “took his own life after years of unexplainable pain”. Many times his family tried to assess help but they were refused because this young man was consuming alcohol and told he couldn’t be helped because of his drinking, which was intrinsically linked to his mental health illness. In a country that celebrates and promotes alcohol throughout its culture, it’s simply not acceptable that someone is turned away from help on account of it. Bressie said his story was “not uncommon throughout Ireland”. He said his friend was “an intelligent, witty young man” who “deserved so much more”. Email “WATCH: Bressie gives impassioned speech about the 'epidemic of this generation'”. Feedback on “WATCH: Bressie gives impassioned speech about the 'epidemic of this generation'”.